GATINEAU, QC, Dec. 7, 2018 /CNW/ - The Library and Archives Canada (LAC) Preservation Centre in Gatineau, QC received the 2018 Outstanding Building of the Year (TOBY®) award at a recent ceremony hosted by BOMA Canada. The only government building under consideration, the Preservation Centre was awarded first place in the national BOMA Best – Gold "Corporate Facility" category. This program is the most prestigious and comprehensive of its kind in the commercial real-estate industry in Canada. It rewards building quality and management excellence. The assessment is based on numerous criteria, including energy conservation, environment, sustainability, emergency preparedness, security standards and training of building staff. This honour is a tribute to the employees of LAC and Brookfield Global Integrated Solutions Canada LP, the company that manages the building. LAC and Brookfield staff take special care of this iconic building, which is not only the pride of the Outaouais and Canada but also the envy of memory institutions around the world. According to Guy Berthiaume, Librarian and Archivist of Canada, the Preservation Centre is not receiving honours and awards by chance: "This recognition is an acknowledgement of Library and Archives Canada's efforts to preserve Canada's documentary heritage under optimal conditions, while making effective use of the financial resources at its disposal." LAC and Brookfield Global Integrated Solutions Canada LP are planning to enter the Preservation Centre in the upcoming international TOBY® competition. The winners will be announced in June 2019 in Salt Lake City, Utah, United States. The mandate of Library and Archives Canada is to preserve the documentary heritage of Canada for the benefit of present and future generations, and to be a source of enduring knowledge accessible to all, thereby contributing to the cultural, social and economic advancement of Canada. Library and Archives Canada also facilitates co-operation among communities involved in the acquisition, preservation and diffusion of knowledge, and serves as the continuing memory of the Government of Canada and its institutions. Stay connected with Library and Archives Canada on Twitter, Facebook, Instagram, Flickr and YouTube. 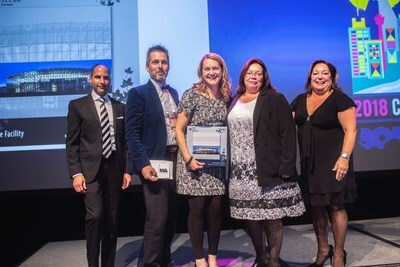 Caption text: At centre, surrounded by BOMA award representatives, from left to right: Steve Chartré (Real Property Services, Public Services and Procurement Canada), Jennifer Côté (Real Property, Library and Archives Canada) and Manon Brazeau (Property Manager, Brookfield Global Integrated Solutions Canada LP).